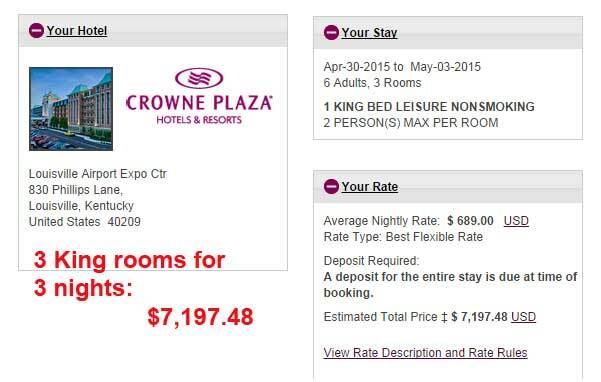 Let's face it, renting anything in Louisville during the Derby is extremely expensive! One or two people coming to Derby can feel pretty good about finding a single decent hotel, albeit during that time very expensive! However, if you're doing the Derby as many do...with a group of friends and family or as a business...then renting a house begins to look pretty good! Do I want our group to feel close during this time, or separate? How many hotel rooms will my group need to book? What amenities or comfort can a private home give vs a hotel? The 3 hotels: Galt House, Crowne Plaza, and Best Western...obviously three different places. Below are the results. 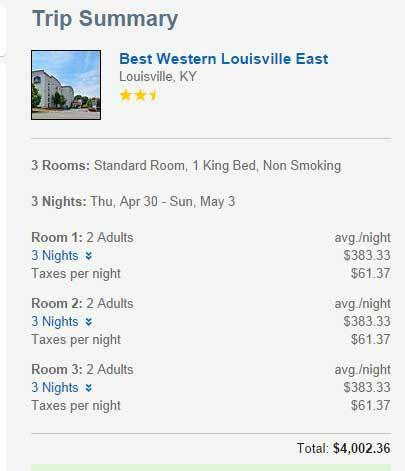 Galt House - To house 3 couple for 3 nights, cost will be over $5,205 per night, Crowne Plaza $2,400 per night, and Best Western $1,334 per night. Shopuld you have more people in your party requiring more rooms, well start adding that into the average! And as I indicated, rates will get even more expensive as Derby draws closer and fewer rooms are available!